So how was our Christmas? Really lovely, actually. So, although Maxi came into my bed and chattered non-stop all night, except when she was joined in thumping my side by Midi, at least we didn’t get up till after 0800hrs. Poor Mini had to be woken! Why so? Well, every time Maxi asked if it was morning, I said, “Not yet! But it will be soon. I can’t wait, can you?” and I’d have a minute or 2 more sleep while she chatted to herself. The Boss even had time to bring me a coffee in bed, and the girls some milk. So we all scampered downstairs about 0815, tanks full of caffeine and milk. Much more civilised start to the day than most Christmases! Everyone gets a tangerine in the toe of their stocking, don’t they? Well, me and The Boss did, so we’ve continued with that tradition. We thought our girls would be like we were, leaving it mouldering at the bottom of the pile of presents, too. We didn’t count on a baby girl who loves citrus fruit to the point of addiction. Mini squealed in delight at seeing her tangerine, troughed it before touching any of her chocolate, and had to be prevented from demolishing her sisters’ fruit. It’s hard to pick out top presents, but Maxi was beside herself with joy at her real ice-cream maker. First ice cream made – banana ice cream. Bleurgh! But she loved it. We all She loved her Paperjamz guitar, pulling the most outrageous poses and declaring it better than a real guitar. Midi literally jumped up and down with joy at her new buggy, which has a few recline positions, a hood and a big basket. She’s only stopped wheeling it around long enough to pretend to hoover with the toy Dyson her grandparents got her (it’s a great sized-down model), or nip about in her surgeon’s dressing up kit, ministering to her sick dollies. ( at the thought of Midi as a real-life surgeon…) Mini loves all the toys: hers, Midi’s and Maxi’s. She’s got more fluffy, frilly ballet tutus to wear over her clothes, and she picked out twin ‘babies’ with her Christmas money herself, on 27th. The Boss surprised me yet again with a fantastic present: a little telescope! I’m a not-so-secret geek and as a kid wanted a real telescope more than anything. But I never got one. As an adult I still skywatch a lot, but with my (now rapidly ageing) Mk 1 eyeballs. So by Christmas night I was as happy as a happy thing having picked out Jupiter and gazed at a big swathe of Milky Way in a real telescope. I’ve still not seen the moon with it – combination of being too busy organising Rainbow Knits sales or the kids on the few nights that the moon’s been visible. Och well – soon! Christmas dinner was a late lunch of exceptionally tender and juicy turkey from The Boss and some seriously yummy plum pudding courtesy of the Glasgow School of Cookery book: much nicer than Christmas pudding. So tummies full, and all played out, zonking from their mega-chocolate rush pre-lunch, all minxes were asleep by 7pm. 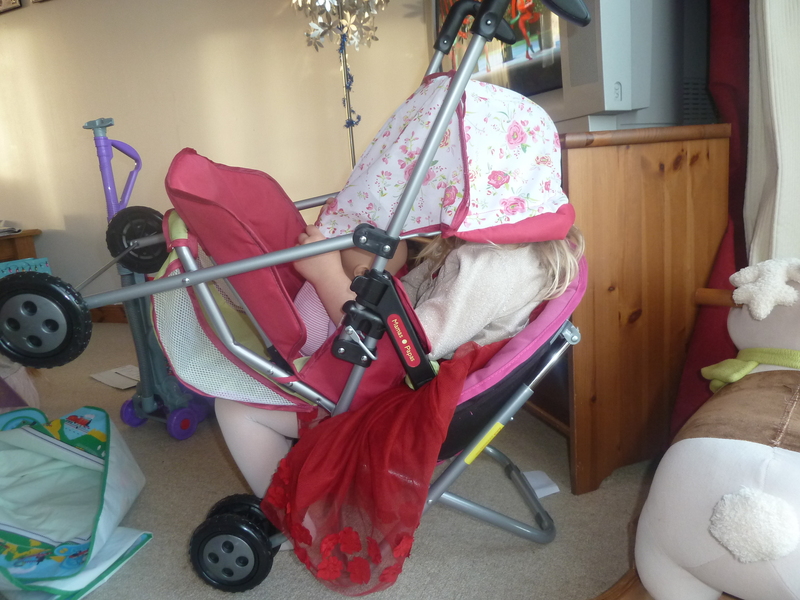 This is despite Midi having a sneaky nap – I caught her sitting in her chair, cuddling her new dolly, snoring her head off with her buggy pulled over her head. I thought I’d still blog about our Christmas because it was such a lovely one, and who knows, I may feel the need to reread it 1000 times if we have a rubbish one in years to come! This entry was posted in Christmas, Pollyanna and tagged Christmas by GrumpyOldTrout. Bookmark the permalink.